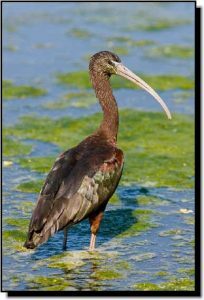 Comments: Glossy Ibises are similar to White-faced Ibises which are more common in the Great Plains. However, both species are undergoing range expansion and may hybridize where they overlap. In breeding plumage, Glossy Ibises have darkeyes and dark lores with narrow bluish borders above and below the eyes which do not extend under the chins or behind the eyes. Their gray legs and feet contrast with reddish ankle joints. During the nonbreeding season, adult Glossy Ibises’ legs are entirely grayish and most of the bluish eye and chin borders disappear. In contrast, red eyes, pink or red lores with wide, white borders extending behind their eyes and under their chins and more extensive pinkish legs and feet are characteristic of breeding Whitefaced Ibises. Immatures of both species are difficult to tell apart in the field.